As noted before on New York Court Watcher, Chief Judge Jonathan Lippman views dissenting opinions more favorably than did his predecessor and many former members of the Court. In Lippman's view--as well as that of others [including myself]--dissents are vehicles which, at the very least, serve to acknowledge that there is a different perspective on the merits of a case. They also serve to point out difficulties or weaknesses that may be present in the majority's position. More than that, dissents typically help to clarify and--in reaction to them--often strengthen the majority opinion. And, not infrequently, they speak to the future when the Court has an opportunity to reconsider the same or similar issue. Not surprisingly then, with the Chief Judge being so welcoming to dissenting opinions, there are many more of them being written then there were in the years before he took over the center seat. 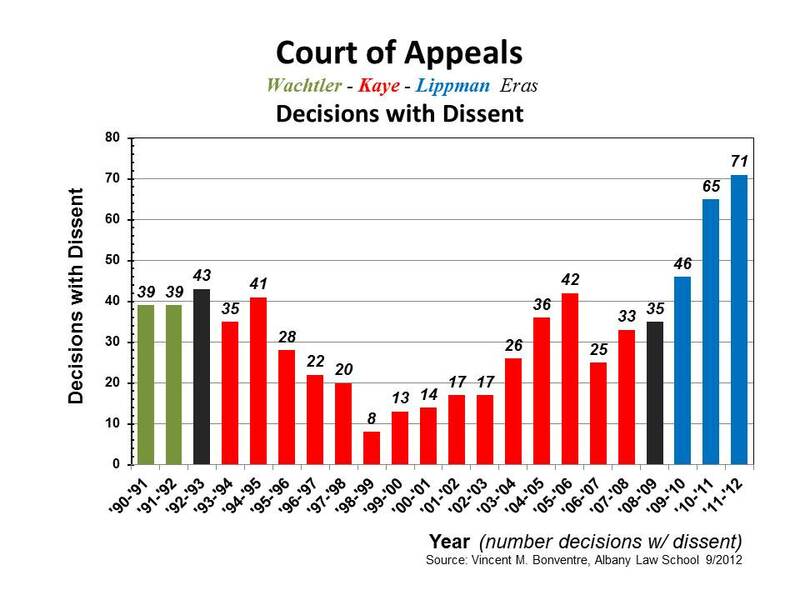 Take a look at the number of decisions with dissent--the climbing number of them--in the first 3 full years of Lippman's tenure as Chief Judge. From 46 decisions with dissent in Lippman's 1st full year to 71 in the most recent. Now contrast that with the last 3 full years under Lippman's immediate predecessor, Chief Judge Judith Kaye. A huge jump. Indeed, the number of decisions with dissent more than doubled from Kaye's last full year to the most recent year under Lippman. But was that final Kaye year typical? Or does that 42 decisions with dissent in 2005-06 suggest that a higher number was more typical? Let's look at an earlier 3-year period--the one beginning 10 years ago. Here it is. The number of decisions with dissent was even lower in that earlier 3-year period of the Kaye era. But, just to be sure, let's go back to the 3-year period before that. Take a look. Well, the number was even lower then. Meaning that the contrast with the Lippman era is even greater. Let's now look at the very first years of the Kaye era, as well as the years immediately preceding that under Chief Judge Sol Wachtler. Here's the graph with those years added. As shown in Graph 5, for the period 1990-91 through 1995-96 (i.e., the 6 years that comprise the final years of Wachtler's tenure and the earliest years of Kaye's), the number of decisions with dissent was typically in the upper 30's and lower 40's. That's considerably higher than the number in the middle years of the Kaye era. But it's still significantly lower than the numbers in the past couple of years under Lippman. Let's look at all of this in 3-year averages. That should give a clearer, cleaner picture of all the data. Here it is. Well, there it is. Could hardly be more plain. The number of decisions with dissent fell dramatically under Kaye. They began to climb in the latter part of her tenure. [N.B. a majority of Republican Governor Pataki appointees by that time.] And, most recently, they have risen again, now to new levels, under Lippman. In fact, the change is even more dramatic then it looks. That average number of 61 under Lippman actually understates the numbers for the last 2 years--i.e., 65 and 71. Finally, just to be complete, to show what the numbers look like for every single year--from the last 2 full years of the Court under Wachtler, through the Kaye era, and to the very last full year under Lippman--here's one more graph. A veritable roller coaster! For those who prefer unanimous decisions, believing it better for a court to speak with one voice and no opposing voices, the middle years of the Kaye era were just about perfect. Dissenting views were rare--or, at least, rarely expressed openly in a dissenting opinion. For those who view dissenting opinions ambivalently--good in that they recognize differing perspectives; bad in that they divide a court and may weaken its decisions--the Wachtler era and earliest Kaye years seem to have achieved a better balance. And for those who believe it better [me included]--both for the integrity of the opinions expressed by a court and for the clarity of its decisions, as well as for that of opposing views otherwise left silent--the increased number of decisions with openly expressed dissents is a welcome change. So there it is. No doubt about it. Chief Judge Lippman made no bones about it early on. He has a much more sanguine view of dissenting opinions than did his predecessor. And Lippman's explicitly welcomed rise in dissenting opinions that was evident from the start of his tenure has continued unabated.